Yes, an appointment is needed for bride to try on wedding gowns. Please feel free to give us a call @647-351-6588, email us [email protected] or book online if you would like to visit the store. Wedding gowns take up to 6 months to come in. 10 months before would be recommended to allow enough time for bridal gown to come in and altered to fit you. Some designer might be able to rush order with an extra charge. Appointment is 1 hour. Please arrive on time to allow sufficient time trying on dresses you are interested. DO YOU HAVE ALL THE DRESSES POSTED ON YOUR WEBSITE? We do carry all the dresses on our website at the beginning of each season. However, given the situation some samples will be sell off the rack during each season, and some last minute bride need to purchase a sample off the rack to get married. Please always check with our consultant to confirm the availability of the sample dress you would love to try on. Our price range is between $1,000 – $15,000. However, 80% of our dresses are from $1000 – $5000. Off-the-rack sample sale starts from $699. WHAT ARE YOUR SAMPLE DRESS SIZE? Our samples are mostly size 0 – 16. Some fit up to size 18. Once you have made a purchase, you may take pictures & vedio of your gown. If you have not purchased, due to designer copyright protection & security, we have a strict no photo policy. If you have a family member who could not attend, you may FaceTime them with free store wifi. We will also provide an iPad in store for you to take photos and compare dresses. All sales are final, no returns, refunds or exchanges. 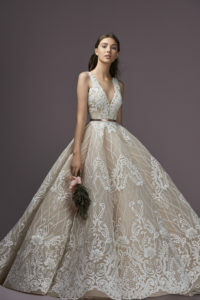 As one of the best Bridal Store in Toronto, Camellia Wedding Gown strives to provide the best wedding dress selection possible, with the highest regards to quality while providing excellent customer service for an outstanding customer experience.